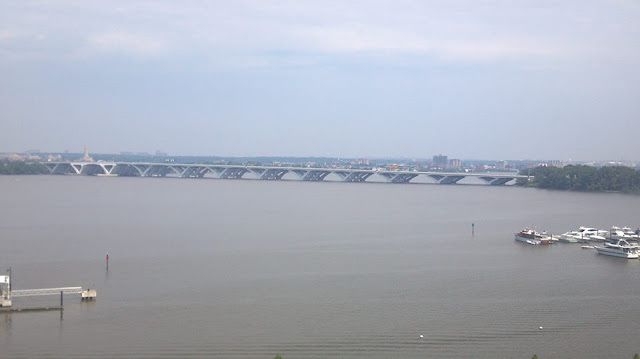 The "new" Woodrow Wilson Bridge project on I-495 (completed in 2008) is an example of a major infrastructure project that fixed problems of the present (capacity and age issues of a relatively low drawbridge on a major highway connection between Maryland and Virginia) and added improvements for the future. It took years to finish, but it created construction jobs at the time, improves interstate commerce on an ongoing basis, created walking trails for recreation and is built to support public transit (if that investment is made). The project wasn't easy politically - contracting, rising costs, delays, and construction problems for neighbors were issues, but the end result is a regional asset that will have benefits for years. If it's worth it in the long run, why shouldn't we get it done? What do you think? You can follow me @DrUrbanPolicy on twitter and facebook. I'm happy to continue the conversation below or on social media. (This post is based on an earlier post from the DrUrbanPolicy facebook page).